Interesting observation. As such a loose aggregate it would seem likely that a penetrating (bunker buster type) nuclear weapon could effectively mitigate an impact risk. It wouldn’t “destroy” the material per se, but it would disperse it into a cloud of much smaller elements. The question to answer would be what happens to that 165 foot size boulder? Would it break apart too, or would it survive intact and be a good proxy for the largest remnants we could expect? I suggest this could be worth a “test” experiment, but not on Bennu since it is in a near impact orbit already and we wouldn’t want to do this unless a large impact was really imminent. 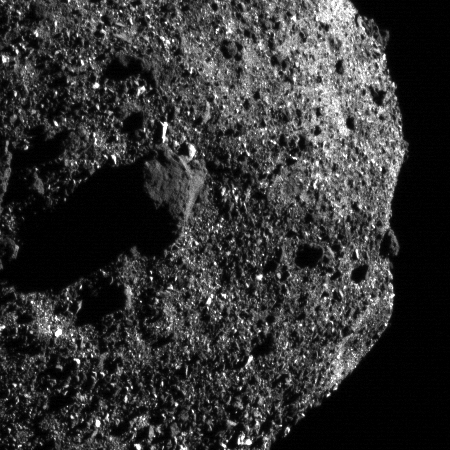 But given that Ryugu and Bennu both appear quite similar I presume many/most of the asteroids out there are similar, and we could pick one in a much safer orbit to blow up to see what happens. It would generate interesting science and be quite entertaining at the same time. It’s the product of the diligent work of a dung beetle. The gif from a few weeks ago failed to show the beetle but it was on the back side pushing it along. Thanks Bob for correcting the glitch.